The Greater Flamingo is the largest of all species. The coloring of them is the main difference for telling them apart. One is very bright red in color and lives along the coast of the West Indies and even into Florida. Those with the pinker coloring are found residing in Africa and East India. This particular species of Flamingo has the most diversified habitat in the wild of all of them. During the colder times of the year, many of the Great Flamingos in Asia migrate to warmer climates. They generally end up in either Iran or India. They won’t migrate though until the weather turns bad so when the season is a mild one they may not end up migrating at all. Due to global warming their migration patterns seem to be getting shorter and shorter. The male Great Flamingos can be up to 61 inches tall which is more than many humans. They only weigh about 8 pounds which is extremely light for an animal that is so tall! Their feathers range in color from dark pink to bright red. They also have areas of white blending in with them. While in flight you will be able to see areas of black underneath as well. They tend to enjoy locations where there is plenty of salt to be found in the water. Many people don’t realize just how well this species of Flamingo is able to swim. That is because they tend to stick to swamps and lagoons that aren’t very deep. They will stand in the thick mud and find plenty of food there to be able to survive on without having to venture into deeper waters. They will stomp their feet in the mud to help stir up the accessible food in the area. The curve of their neck is very flexible due to the many vertebrae found there. They also feed upside down in the water. You will notice their black beak has a very unique design to it. They are filter feeders so they take in both their prey and water with the water being filtered back into the body of it. They feed on a variety of organisms including larvae, plankton, small fish, and whatever else the can find in those shallow bodies of water. The pink coloring for their bodies comes from the crustaceans that they consume as a big part of their diet. 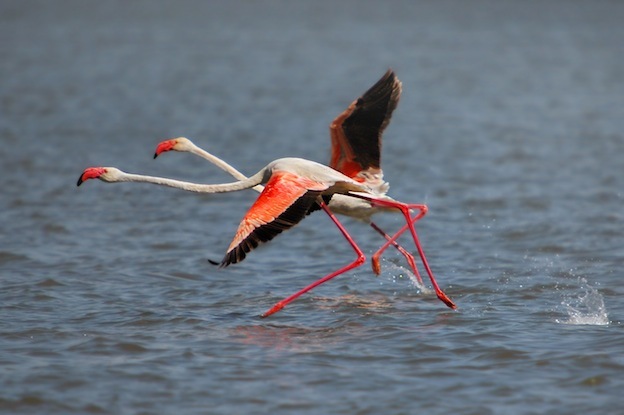 Shrimp are generally plentiful in the locations where the Greater Flamingo resides. Their mating habits are consistent with those of other species of Flamingos. If they don’t get enough food to eat they will lose the pigmentation and their feathers will only be white. They also won’t engage in mating at all if they don’t have enough food to survive on themselves. They communicate vocally with a type of honking that is very similar to the sounds that geese make. Living in extremely large colonies, they are able to use these sounds as well as non verbal forms of communication to engage with each other. They don’t like their natural environment to be disrupted by noise, people, or other animals though. This can create high levels of stress for them to deal with. The oldest Greater Flamingo in the world is found in a zoo located in Australia. He is at least 77 years old, but the exact age isn’t known. He was already grown up when he arrived as depicted by the colors of his feathers. The younger ones don’t get the pigmentation until they are at least 3 years of age.